Heavy duty Perf-Pak 4 pack rings are beneficial for popular carriers and easy to apply to your cans. 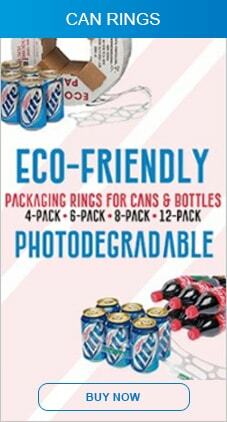 These 4 pack rings will fit on cans and all major soda brands. 4 pack can rings are perforated to snap apart into individual 6 packs. They are designed to be used by hand. Available on spools of 1000 carriers and large reels of 3000 carriers. Use on 12-ounce beer and soft drink cans. 4 pack beer can plastic rings can be applied by hand or with our six packer machine.